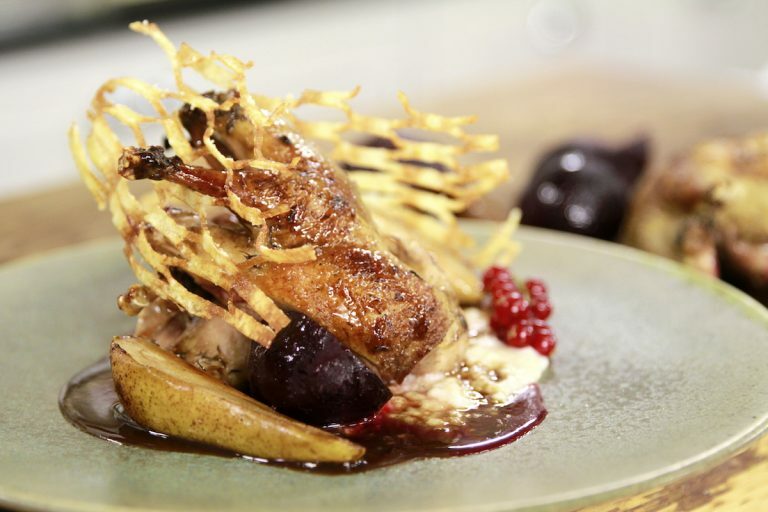 If you're looking for an alternative to your usual Sunday Lunch this Partridge with Bread Sauce is just the thing! It is served with redcurrant jelly, game chips, baby beets, kale and pear. It's a real next level meal that will score lots of praise from your nearest and dearest! Yum! Melt the butter and oil in a pan over a medium heat and, when hot, fry the partridges, skin side down for 2 minutes. Flip over and cook for another 2 to 3 minutes then pop in the oven for 10 minutes then rest. To make the bread sauce stud the onion with cloves and place into a pan containing the milk. Bring to the boil then remove from the heat and leave to infuse for 20 minutes. Warm the butter in another pan, add the breadcrumbs and milk (remove the onion), season and stir through the cream. For the pear and vegetables, melt some butter in a pan over a medium heat. Add the beets, kale and pear and cook for 2 minutes. To make the game chips, heat a deep fat fryer to 180°C. Place a potato into a Japanese mandolin and rotate until you have enough to cut two latticed squares. Dust with cornflour and deep fry until golden. Cut each partridge into 2 leg and 2 breast portions–the meat should be nice and pink. To serve, pile up the veg mixture onto plates, top with the partridge pieces, drizzle over the stock sauce, spoon on the bread sauce and garnish with game chips.